Recently a friend and very talented artist, Bob Miller, mentioned that he was helping organize a fund raising event for the local not-for-profit Westminster Village Foundation in Scottsdale, Arizona. The Foundation raises funds for Westminster Village, a not-for-profit life care retirement community, which are used to assist residents and provide scholarship funding for employees. To help the Foundation’s efforts, they sought items that could be auctioned during their annual “Foundation Gala.” Bob and I decided that I could offer to paint a pet portrait for the winner of the open bidding event during the evening’s festivities – and that’s where “Griffin” entered my life. The winner of the bidding on my pet portrait was Jessica O’Shea who shares her life and home with her husband Daniel and their best friend Griffin. Griffin is a beautiful Black Labrador, and Jessica shared several photographs with me of him. We then settled on the most expressive one which I used as a reference for my painting. Today, Jessica dropped by my studio to view Griffin’s portrait for the first time, and she was ecstatic. “It looks just like him,” she said as I opened the packaging. 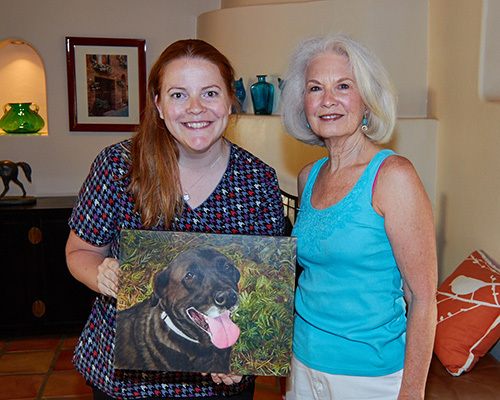 All in all it was a great experience to help the Westminster Village Foundation in their fund raising efforts, and to provide Griffin’s humans with a portrait of their beloved pet. Thanks also to Bob Miller for including me in the group’s efforts. For more information on the Westminster Village Foundation and Westminster Village, please visit their web site at: https://www.wmvaz.com/. Thanks Holly. Hope your summer is going well and you’re busy working on new projects. Just beautiful Pam! You did a fantastic job and Griffin’s owner should be ecstatic! I didn’t realize it was such a big portrait. Well done my friend!! Thanks so much for your kind comments…Hope to see you soon. Hi Pam, Your portrait is expert, and I see you can go far with animal portraits!! Thanks for your kind comments. I will be submitting paintings to the annual Northern AZ Watercolor Society fall show. I’ll let you know if any of my paintings are selected. Hope you and your kitties are fine. Great picture. When will you be getting a lab? thanks for stopping by and commenting. I doubt I’ll be getting a lab anytime soon given our house full of cats. Thank you again Pam for this beautiful painting of Griffin! It’s absolutely stunning. My husband already has it hanging in the hallway! It was an absolute pleasure to have met you and Your husband. Thank you again for capturing my fur son so perfectly! So happy you and your husband enjoy the painting of Griffin. He seems to have such a sweet personality. Give him hugs.